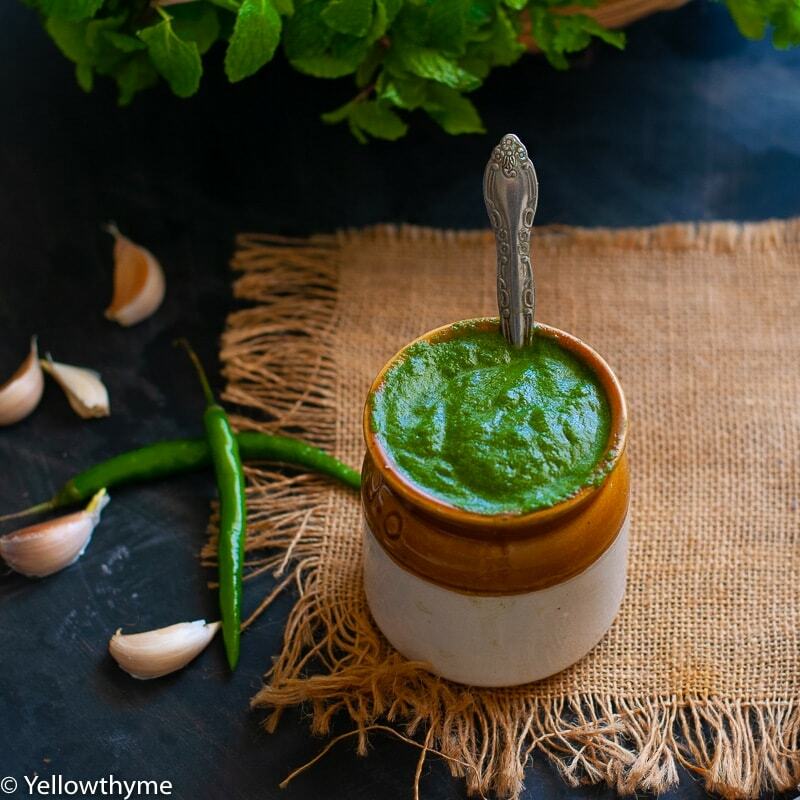 There are a lot of ways of making green chutney.Every house has a different way.This Indian Green Chutney Recipe is a simpler version of the chutney I grew up eating. This can be used to make Chutney Cheese Sandwich or eaten along with Tehris, as dips for parties, as a marinade of chicken and most obviously with Samosas.Lol. Tricks to make the Best Indian Green Chutney Recipe! I have some tricks up my sleeve to make the best green chutney possible!Here it goes. Wash wash and wash your leaves several times.Can’t stress this enough.Getting even a little bit of mud in the chutney will leave a bad taste in the mouth. Use raw mango instead of lime if you can find it.It will not only give body to the chutney but also lend a beautiful flavour. Though the recipe says 1 whole green chilli, use your judgement.If your chillies are super hot then use only half or avoid altogether. If the chutney is too spicy for your kids, add a dollop of yogurt in it. With this one condiment there are endless dishes possible. This is one of my favourite marinades to make Chicken Breast.I call is Chutney Chicken. I also use it as a dressing for quick salads.This Sprouts Chutney Salad is so easy to put toghether once you have the Chutney sorted! Also, you can make the easy peasy Chutney Cheese Sandwich with this.Frankly, thats my guilty pleasure!I also serve this at parties along side other dips like the Simple healthy but uber delicious Yogurt Dip. Now for the BONUS! This Indian Green Chutney Recipe is Vegan,Whole 30, Paleo approved and Gluten Free! This chutney also freezes very well.I usually freeze them in 1/2 cup sized boxes which I defrost as and when needed. Add onion,Cumin,Ginger,Garlic Cloves & Chilli to the blender. Top with the Leaves- Coriander and Mint.Add Lime juice. Blend till it's a smooth puree.Add water 1 tsp at a time is its too thick. Add Salt,Churn again and store in an air tight container in refrigerator for upto 7 days.